K.A.R.D or KARD is a new group formed by DSP Media in 2016 but officially debuted in 2017. KARD is a mixed group with two male and two female members, B.M, J.Seph, Somin, and Jiwoo. Prior to their official debut in 2017, K.A.R.D had released three pre-debut songs such as Oh NaNa, Don’t Recall, and Rumor. After succeeding with three pre-debut songs, on July 19th, 2017 K.A.R.D officially debuted with single, Hola Hola and on the same day they set Hidden KARD as their fandom. Then on November 21st, 2017 they cameback with the single You In Me. Even before the official debut, K.A.R.D has successfully held a tour to various countries and even to Europe. Let’s see the full discography of K.A.R.D! K.A.R.D is arguably one of the groups that presents a unique concept, the card. 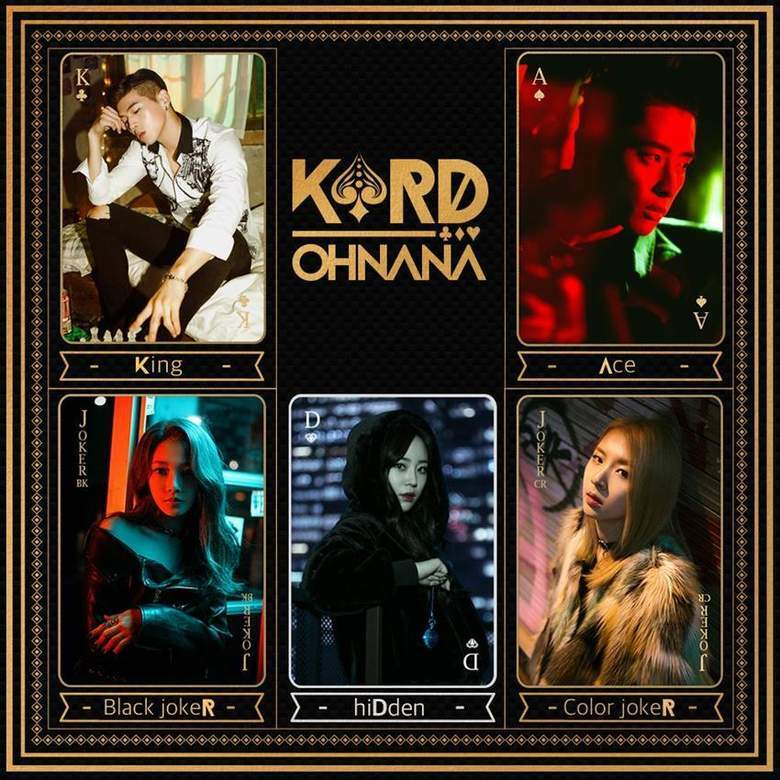 Each member holds a meaning of a Card, like As or Ace for J.Seph, King for B.M, Black Joker for Somin, and Color Joker for Jiwoo. Before their debut, K.A.R.D surprised netizens with their pre-debut song Oh NaNa released on December 13, 2016 with Youngji Ex-KARA as Hidden Member. Successfully stole the netizens’ attention with Oh Nana, on February 16th, 2017 K.A.R.D released their second project with Don’t Recall. Succeeding with the second project, on April 24th, 2017 K.A.R.D released their third project with the song Rumor. Although not yet an official debut, K.A.R.D already held a world tour. They held their first tour in 2017 The 1st Tour “Wild K.A.R.D” starting from May to June 2017 in the Americas. While the new European tour will be held in September 2017. Succeeded with all their projects and tours, on July 19th, 2017 they officially debuted with Hola Hola and on November 21st, 2017 when they came back with the song You In Me. K.A.R.D’s first project before their debut, was released on December 13th, 2016 with the title Oh NaNa. With Oh Na Na, K.A.R.D presents an upbeat hiphop feel. Interestingly, Youngji ex-KARA became a hidden member, which only helped promote the debut and counts as a permanent member. With Oh NaNa, K.A.R.D succeeded in obtaining a satisfactory ranking in various Charts and Music Videos successfully watched by 500,000 viewers for two days. They are up to number #4 on the US iTunes chart in the k-pop category within one day. Additionally, the album reached number 10 on Japan’s iTunes chart in the k-pop category and has also been listed on the chart in the UK, France and more. K.A.R.D really managed to steal the attention of local and foreign netizens with their first project. Let’s see Music Video from K.A.R.D – Oh NaNa. Succeeding with their first project, K.A.R.D again surprised their fans by releasing a second project with Don’t Recall on February 16th, 2017. This time K.A.R.D comeback with a slightly mystical concept but still elegant. In the 3 months since its release, Music Video has reached 20 million viewers and in 24 hours successfully watched by 2 million viewers. This proves that K.A.R.D managed to steal the warganet’s attention even before their official debut. Don’t Recall is definitely a unique song. From the moment it begins, there is a strong synthetic, tribal-like beat that sounds mesmerizing and quite impressive. The instrumental is loud and blaring as it utilizes a unique, repetitious echoing “Da Da Da Da Da” vocal with auto-tuned trumpet pitches alongside consistent drumming and snares. Music Video provided is also very unique and has the right angles of the movements every member. It gives a very interesting impression of seeing the four members from close range with excellent camera movements. 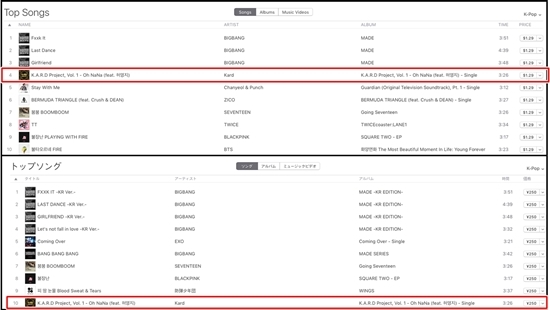 Currently, the newest song K.A.R.D has been up in iTunes K-Pop in America with the first position. K.A.R.D is also in position #22 for iTunes in the UK and #34 for iTunes Brazil. 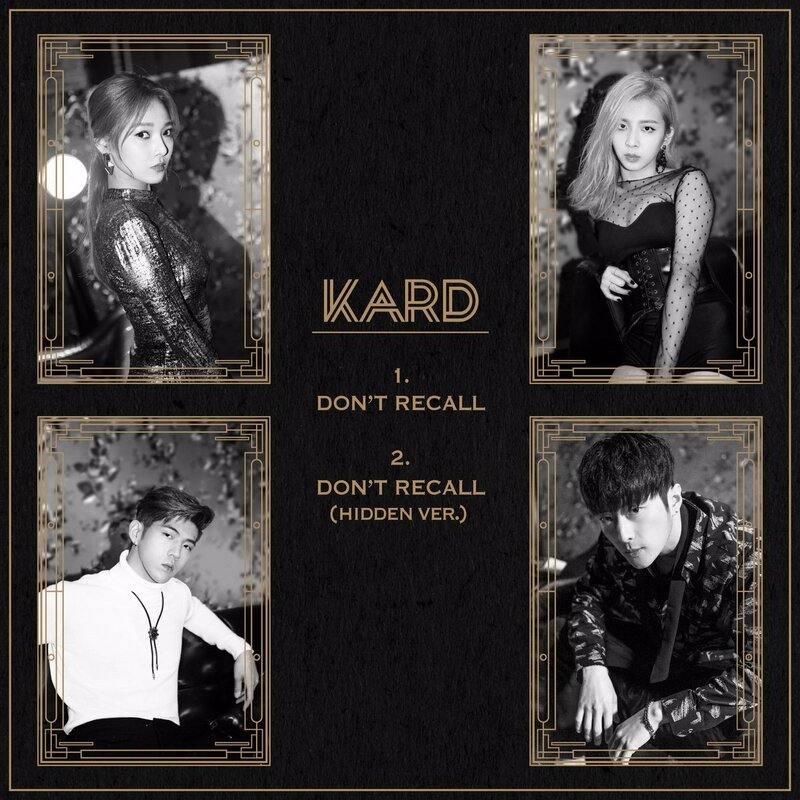 K.A.R.D also release the English Version of Don’t Recall! Check this out!